Public comment processes in federal and state agency rulemakings are among the most substantial potential arenas for public input into government. Unfortunately, these processes have not been much used for thoughtful public input. This research sought to shed light on whether online democratic deliberation, without facilitation, and natural language processing tools could empower participants to provide more informed input into an agency rulemaking. It also sought to determine whether such an approach had other positive effects such as enhancing citizenship and increasing confidence in the pertinent agency. Findings indicate improvements in participant knowledge of the network neutrality rulemaking topic, systematic attitude change, improvements to citizenship measures, and increased confidence in the Federal Communications Commission. Results suggest that public deliberation under conditions needed to involve substantial numbers of people—namely, online deliberation without facilitators—can improve public comments into federal and state agency rulemakings while strengthening the citizenship qualities of participants. They also indicate that many of the desired effects of face-to-face deliberation with trained facilitators can also be obtained online without facilitators. The recent trend in open government initiatives in the United States and elsewhere has brought about noteworthy new opportunities for citizen engagement not only in interfacing with government but in participating more deeply in the policy process. The Obama administration’s efforts on open government led to three principles: transparency, collaboration, and participation (“Transparency and Open Government,” 2009). 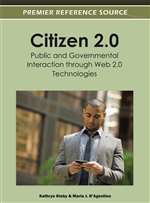 One of the ways that open government initiatives can manifest is through using the myriad of applications cast under the umbrella of “Web 2.0” (Chun, Shulman, Sandoval, Hovy, 2010). These technologies primarily include social media that enable collaboration and sharing among individuals, helping to facilitate the “wisdom of crowds” (Shirky, 2008). ICTs in general have been looked to for increasing efficiency and inter-agency cooperation as well as interfacing more effectively with the public (Margetts, 2009), in what Dunleavy, Margetts, Bastow and Tinkler (2006) refer to as a new “Digital Era of Governance”.